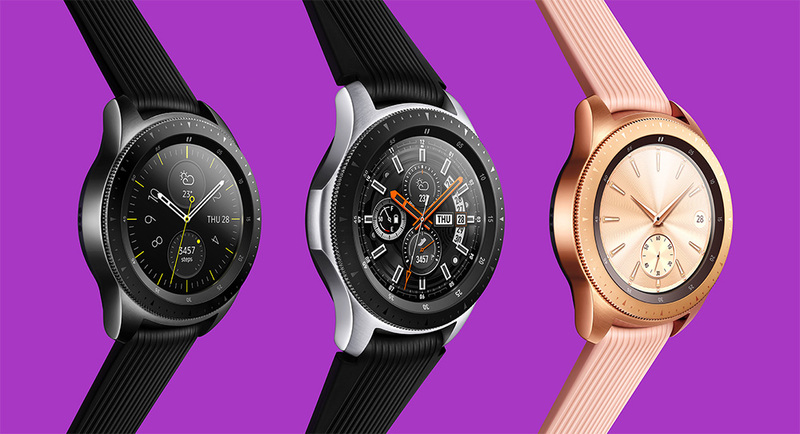 Alongside the Galaxy Note 9, Samsung today announced their next smartwatch, the Galaxy Watch. No, it doesn’t run Wear OS and does indeed just run Samsung’s own Tizen operating system. It does come in two sizes, though, and arrives at the same time as the Note 9. The Galaxy Watch will go up for pre-order tomorrow, August 10, and then arrive in stores on August 24. It comes in two sizes, 42mm and 46mm, and costs $329.99 or $349.99, respectively. You’ll be able to buy this Bluetooth-only model from Amazon, Best Buy, and Samsung’s store. An LTE variant will arrive later this year from carriers. The 42mm Galaxy Watch comes in either Midnight Black or Rose Gold, while the larger 46mm model comes only in Silver. Other than size, what’s the difference between the two? You can see the full Galaxy Watch specs list below, but the basics are this. The larger 46mm model has a 1.3″ screen and the 42mm model has a 1.2″ screen. The 46mm model supports bigger 22m straps, weighs more, and has a bigger 472mAh battery. The 42mm option supports 20mm straps and has a 270mAh battery. Both feature dual-core processors, Tizen OS 4.0, heart rate sensors, wireless charging, 5ATM + IP68 durability, NFC, GPS, and always-on full color displays. The Bluetooth model has 768MB of RAM and 4GB storage, whereas the LTE model has 1.5GB RAM.